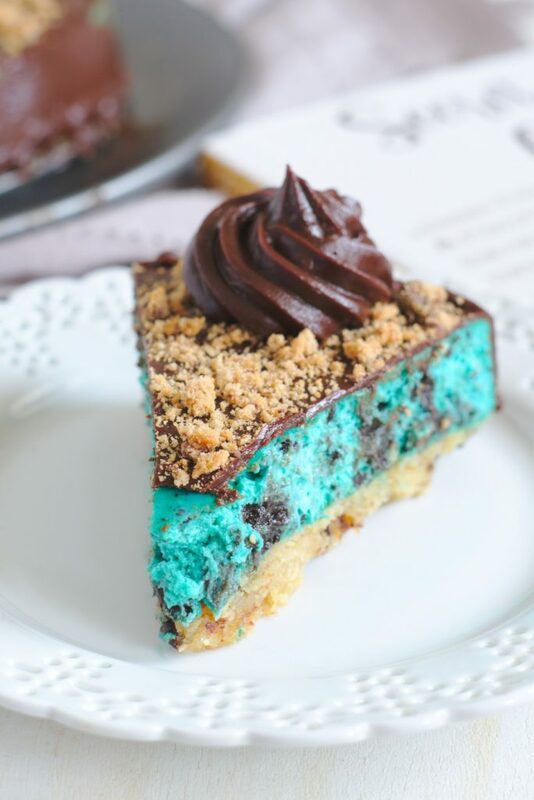 Cookie Monster Cheesecake – A gorgeous and whimsical blue cheesecake! Chocolate chip cookie crust, a blue cookies and cream cheesecake filling, topped with a creamy chocolate ganache and crushed chocolate chip cookies! Preheat the over to 350 degrees. Butter and dust a 8" springform pan with flour. In a microwave safe mixing bowl, combine butter, salt, and brown sugar. Heat in 30-second intervals until butter is melted, stirring each time. Set aside to let cool slightly. Add egg and vanilla to the butter mixture, stirring until well combined. Add flour in to the batter in batches, mixing well each time. Once mixed together, fold in chocolate chips. Transfer the batter to a prepared pan and spread evenly. Bake for 15-16 minutes. Remove from oven and let cool. Preheat oven to 300 degrees. In a large mixing bowl, whip together cream cheese, cornstarch, and granulated sugar until smooth. Add in cream, salt, blue food coloring, and vanilla, continuing to whip until all ingredients are well combined. Use more blue food coloring until the color is the right shade of blue. Add in one egg at a time, mixing until fully combined. Fold in crushed oreos, do not over mix. Pour cheesecake batter over cooled blondie layer. Tightly double wrap the bottom of the springform pan with two pieces of foil. Place the springform pan in a larger baking tray and fill the baking tray with hot water. The water level should be halfway up the sides of the springform pan. Place the baking tray in the oven and bake for 60-70 minutes. The cheesecake should be set but still a bit jiggly in the middle. Turn off oven and let the cheesecake cool for 15-30 minutes while still inside the oven with the oven door left ajar. This helps finish cooking the cheesecake a bit more. Remove from oven and let cool to room temperature for about 4 hours. Loosen the cheesecake from pan. Refrigerate over night. Place chocolate in a heatproof bowl. Add in cream and salt, microwaving in 30-second intervals, stirring in between until chocolate is melted. Once smooth, let cool. It needs to be thick and cool while still being spreadable. Once cheesecake is chilled, spread the chocolate ganache all over the cheesecake. Sprinkle crushed chocolate chip cookies on top and serve.